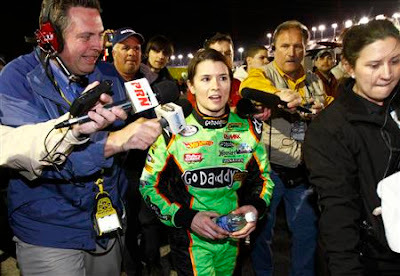 A few NASCAR drivers have started to show their frustrations at the media firestorm that is Danica Patrick at Daytona. Patrick has been at the center of attention. 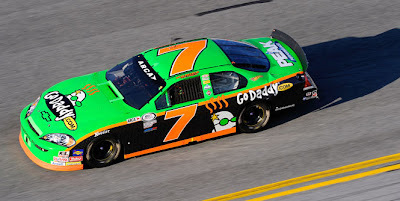 Following up her debut in NASCAR's double-A equivalent minor league, ARCA, current IRL driver Danica Patrick continues to be the story in what is supposed to be NASCAR's biggest week. Patrick finished 6th in the ARCA race and exceeded most expectations, considering the race was her first in a stock car. Building on that success, Patrick and her team, Dale Earnhardt Jr.'s JR Motorsports, decided to give her the green light for the Nationwide Cup race on Saturday (Patrick has an agreement to drive at least 12 Nationwide Series events, considered the Sprint Cup's triple-A circuit). The first practice for the Nationwide Series race took place on Wednesday. The subsequent media frenzy, with reporters focused on Patrick, has thinned out the crowds for some of the sport's biggest drivers. Jeff Gordon emerged from his traveling trailer surprised at the few scant reporters waiting for him outside. Other drivers have encountered more questions about Patrick than about their own preparations for the start of the NASCAR season, but all the big names have handled the media with aplomb. Jimmy Johnson, four-time defending Sprint Cup champion, noted that he was encouraged by her presence: "As long as it is bringing eyes to the television sets and putting butts in the seats in the stands, that is a good thing." "According to the media not only is Danica the most amazing racing driver since Dale Sr., but she also is related to Jesus." "Maybe ESPN could cover Danica on ESPN2 and the other 50-plus cars on ESPN classic or something." For the record, neither of these guys have much credibility for their NASCAR careers. Between the two of them, there are 100 NASCAR Sprint Cup starts with an average finish position of around 30th place. Still, for a sport with a desperate need for a ratings boost, during its most important week of the year, with a driver who has been a bonus for every circuit she's been a part of, it's curious to see some low-level drivers deliver some media criticism (both Tweets seem more like criticisms of media than Patrick, right?). "First and foremost, it's about racing in Daytona. It's the biggest race for a lot of people. You win at Daytona and things change for you. And that's going to be our primary thing. After that, the next biggest story, and quite frankly opportunity for all of us, is Danica. It's our strong belief that there will be people that turn on Saturday's Nationwide telecast that perhaps don't watch a lot of Nationwide races or NASCAR at all, because of the interest in her. We want to serve that curiosity. We want to serve that interest because our belief is if they like what they see, and we provide them what they're interested in, they may come back next week, and next week, and watch Fox's Daytona 500 coverage, and read more stories. The more people that watch, the more successful the entire sport is. It's a balance thing but we also view it as an opportunity." To me, that speaks volumes (also notice how in sports, people typically refer to female athletes by their first names). For Speed and Smith, it looks like they will be getting plenty more Patrick coverage. And they won't have to look too hard to find it. I don't really know or care enough about NASCAR to offer much of an opinion on Danica Patrick or the events surrounding her at Daytona. However, I am curious to learn what you are implying when you say people often refer to female athletes by their first names. Sure thing. From a 1993 article in Gender and Society, and after studying hours and hours of sports coverage, researchers found, "There were stark contrasts between how men athletes and women athletes were referred to by commentators....when athletes were named, commentators used the first name only of the women far more commonly than for the men." Why is this significant? The article continues: "Research has demonstrated that dominants (either by social class, age, occupational position, race, or gender) are more commonly referred to by their last names. Dominants generally have license to refer to subordinates (younger people, employees, lower-class people, ethnic minorities, women, etc.) by their first names...And research suggests that these lingustic differences both reflect and (re)construct inequality...Moreover, it is reasonable to speculate that this language is likely to be receive by viewers in such a way that it reinforces any already-existing negative attitudes or ambivalences about women's sports and women athletes." Now, this isn't necessarily uniform, just more of a trend. Still, is it valid today? The overall notion is that using first names keeps for female athletes keeps them in a subordinate position - comparative to male athletes. I think the coverage of Danica Patrick is emblematic of that. I agree that referring to a person by their first name can be seen as an attempt to place that person into a subordinate position. Unfortunately, I’ll need a little more convincing that this is happening in the case of Danica Patrick. First, I believe that just because you are referring to someone by their first name it doesn’t mean you are attempting to subjugate them. Many standout athletes are known by their first name. Look at players like Kobe Bryant, Lebron James, Cal Ripken, Pedro Martinez, Manny Ramirez, Rickey Henderson, and Dale Earnhardt Sr./Jr. I don’t think it could be said that these players are referred to by their first names because they are seen as subordinates. It is quite the opposite. These players are known by their first name because they are standouts within their own sport. It is for this reason, I believe, that Patrick is referred to as Danica. Second, how can it be said that she is viewed as a subordinate whilst fellow racers are complaining that she is receiving a massively disproportionate amount of media attention? That seems inherently contradictory. Third, if we assume that she isn’t being referred to by her first name for these nefarious reasons, would it be a problem to refer to her by her more feminine sounding “Danica” rather than her masculine sounding surname of “Patrick?” Would it be a bad thing to remind people that she is a woman to underscore the importance of her achievement of being the first female racer in NASCAR? If she was being referred to by her masculine-sounding last name, would you call it an attempt to assimilate her into the male-dominated sport of NASCAR and hide her femininity? I don’t dispute the idea that something like what you are suggesting is happening is possible and has happened in the past, I just doubt that it is happening in this instance. On your first point, I completely agree, using first names is not always a subordinating action. Certainly you could make the same point about Venus, Serena, Annika, and so on. I would suggest that these kinds of athletes - like Tiger or Lebron - transcend because they are commodified so prodigously. For instance, I'm pretty sure Venus Williams has her own line of clothing, called Venus. On your second point, just because she is getting a lot of media coverage doesn't mean, to me, that she isn't being referred to as a subordinate. The key term is "referred to." The idea is that the process of naming is gendered. On your third point, what about using her full name? And to answer your question, no I wouldn't find it problematic to use her last name and no, I don't think it would be hiding her femininity. If the public has seen a Go Daddy commercial, I think they're fully aware of her femininity. At the end of the day, in this instance, Danica Patrick may or may not be a case. But it will be an interesting story to follow as her NASCAR career develops.